for a full list of dates and available spaces please see our Facebook page. Puppy classes are a brilliant way to lay the foundations for a great bond and a happy life with your dog. In our group classes your puppy will have the opportunity to learn life skills like coming back when called (recall), walking nicely on a lead, stay, sit/down/stand, hand touch, handling and grooming. Our instructors will help you with common puppy questions and teach you how to keep your dog’s attention on walks. For puppies from 10 weeks (who have been fully vaccinated) up to five months of age. This is an eight-week course and is £90. Once you and your puppy master the basic training you can progress to the next level of classes! **£15 Telephone consult** Are you thinking of getting a puppy? Maybe you dont know what to look for in a breeder? Or how to start housetraining? Where is puppy going to sleep and how to deal with that first night? Get the answers to any questions you may have and ask anything you want for up to an hour! 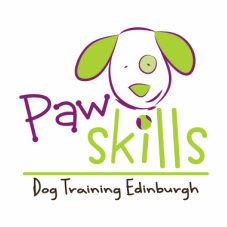 Email pawskills@gmail.com to arrange a session. This class is for older puppies, new rescue dogs or older dogs who need to revise the basics! Covering things like: coming back when called (recall), walking on a lead, leave, stay, sit/down/stand, hand touch, drop and focus. This is an eight-week course and is £90. Building on the skills learnt in beginners’ class, this course takes things to a more advanced level. Things like off-lead work, teaching your dog to leave food on the move, out of sight stays and working with distractions are covered. Suitable for graduates of our beginners’ class or anyone who wants to further their dog’s training! This is a great class for challenging your dogs brain! It's a mixture of obedience, tricks, games, scentwork and shaping and brain games. Suitable for graduates of the intermediate class. This is a eight-week course and is £90. This fun tricks class is suitable for both older puppies and adult dogs, NO PREVIOUS TRAINING NEEDED. Teaching tricks is great fun and improves the bond you have with your dog. Tricks are also good for mental stimulation and physical fitness for your dog. We cover tricks like spin, beg, weave, walk backwards, run around a cone, hoop jump, fetch a hanky when you sneeze and more! Most useful of all – we teach your dog to find your car keys! Great if you ever lose them on a walk! This course is 8 weeks and costs £90.